Here’s some good news — Chicago Repertory Ballet will present an evening of four World Premieres in their Modern Motions program at the Athenaeum Theatre on Friday April 6th and Saturday April 7th, with both of the performances at 8pm. Modern Motions looks to be very much in keeping with Artistic Director and Founder Wade Schaaf’s original vision for the Company, and that’s certainly good news too. Johnny Nevin: Can you tell us what we’ll be seeing in Modern Motions at the Athenaeum. What are the works that Chicago Repertory Ballet will be performing? Can you tell us a little about the four World Premiere’s that we’re hearing about — by choreographers Tenley Dickey, Ryan Jolicooeur-Nye, Shannon Alvis, and yourself? Wade Schaaf: Modern Motions is going to be a lovely and unique program. There is going to be a large mix of works, ranging from balletic works scored by vast orchestral compositions, to Israeli inspired modern dance scored by classic jazz tunes, and everything in between. It’s bound to be a fun and engaging program with a little something for everyone. The premieres on the program vary in tone and style greatly. Ryan Jolicoeur-Nye’s new work is a dance for 5 couples. The women en pointe move sumptuously, partnered by the men of the company. The movements in this piece are luscious yet technically challenging. Scored to minimalist contemporary music, the piece takes us on an arc similar to that of the setting sun. Shannon Alvis’ new work is inspired by nature, specifically trees — which comes from the accompaniment, Ezio Bosso’s Second Symphony of the same theme. The movement of the piece is contemporary and lovely, with groups of dancers like trees moving together, and then breaking apart in solos and duets. Tenley Dickey’s new work blends Israeli inspired improvisation techniques with American jazz standards such as “All of me” and the Humoresque for piano, creating a very unique piece of choreography. It’s light, yet insightful and certainly enjoyable. My new ballet Grand Pianola Music: On the Dominant Divide is my take on a ballet ‘grande finale’. I was inspired by this vast orchestral score, and I wanted to choreograph a big, beautiful ballet. There’s nothing heavy or overly-thought here, it’s JUST DANCE! I wanted to continue to play with this idea of mixing classical and contemporary movements, and that is showcased in this work. More than that, I just wanted to make a fun ballet! Johnny: We’ve seen Chicago Repertory Ballet many times, and we certainly appreciate the variety of creativity that CRB always presents. But for our readers who haven’t seen the Company yet, can you tell us a little more about “Dance That Defies Labels”, and how that idea is reflected in Modern Motions? Sure! The idea “Dance that Defies Labels” comes from my idea that dance is an ever growing and ever changing art form, especially where ballet is concerned. I discard the idea that in this day and age we need to classify dance by genre. Why must there be rules as to what is and is not ballet? I’ve personally had a vast career dancing in different companies and performing choreography that varied in style throughout my career. Now that I have all of these influences in my back pocket, I want to widen my perspective in my own work, drawing from all of these influences. So, I want to push the art form and play with bending the rules about what we consider “ballet” in all ways, including movement vocabulary, presentation, concept and so on. I think that Modern Motions falls in line with these sensibilities, as many of the works on the program have this sort of variety to them. You will see pointe shoes and you will see dancers dancing in socks in this program. You will see classical pas de deux moments and you will see contemporary partnering. You will see works that appear more classical and you will see works that appear more conceptual, and everywhere in between. But more than anything, you will see a lovely program that is sure to delight, entertain and inspire. 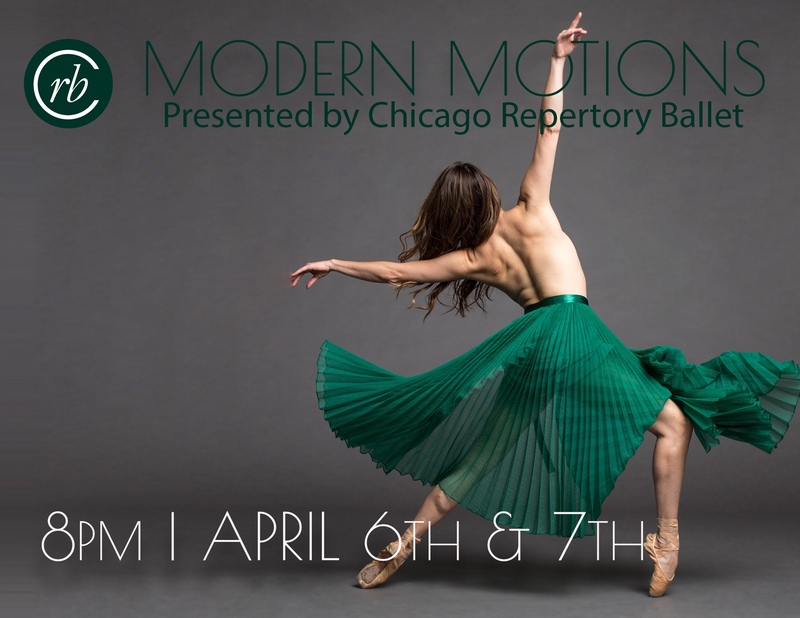 Chicago Repertory Ballet will present Modern Motions at Chicago’s Athenaeum Theatre (2936 N Southport Ave, Chicago) on Friday April 6th and Saturday April 7th — both shows are at 8pm. Tickets are available online from The Athenaeum, or by phone from the Box Office at 773 935-6875.